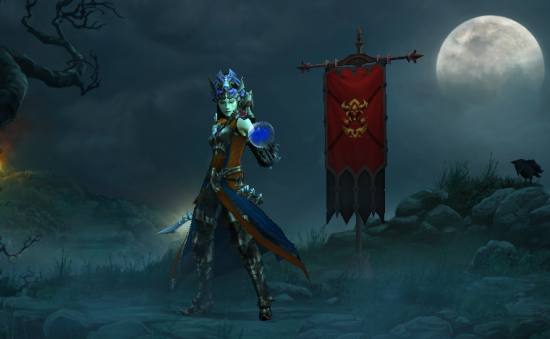 Diablo III: Let the Nightmare Begin! No Comments on Diablo III: Let the Nightmare Begin! After a couple of attempts… maybe a few more on top of that, my level 31 wizard was triumphant and took down Diablo! Okay, it was only on normal but small victories people, small victories. Now that I’ve moved on to nightmare mode it feels like I’m actually starting the game for real and that everything up until this point has been a practice run for the main event (I’m not quite ready to consider inferno just yet)! Normal mode was where I got to know the story and also where I got to grips with how to play, or how not to play, my wizard. I did make a ton of mistakes, but I definitely learned from them and embrace them as part of the game experience. I ran through normal as a single player, but I think that nightmare for me is going to be all about the co-op, I’ve now done the practice run so I don’t need to worry about slowing down my team to go and look at an interesting rock or marvel over a perfectly placed rainbow! Of course, there were times when I would find myself stuck, I would be at a boss fight and have trouble taking the boss down – so I did what anyone would do, I checked out the D3 forums to see how other people were overcoming these issues. There was a pretty even split between people that could solo normal with a wizard without batting an eye, and others like myself who tended to encounter sticking points; I found some really good advice on tactics to overcome my limitiations (being seriously underpowered) and so I thought I’d share a few of the things I learned along the way that would have definitely helped me. Train your Gem Cutter: Of course I had socketed gems, but I hadn’t spent the time training up my Gem Cutter, by the time you hit level 31 you should really be crafting flawless gems to boost your stats. Socket the Right Gems: I had traded a lot of damage for vitality that I just didn’t need, this was why I took so long to kill bosses, I was playing defensively (equipping too many amethysts), trying to keep alive but not doing very much damage – you need the right balance. Wizards Need Intellect: Equip yourself with armor and weapons that provide intellect, in fact every slot should be giving you intellect. As with the gems I was sometimes equipping items that conferred vitality only instead, keeping items that were lower in damage, intellect or level in order to keep the ‘life’ they provided me. Train your Blacksmith: He will be able to make the items you need without you worrying about getting the right drops all the time. Farm, Farm, Farm: If there is one thing you need then that’s gold, training your blacksmith, gem cutter, buying new items in the auction house, repairs etc., all takes gold so don’t miss any opportunities to farm it. I think the only other thing I can add is that picking your skills is a fine art, and it really depends on how you play the game. For the most part it’s a lot of trial and error, swapping skills in and out to see what works best and suits you, but you can find plenty of builds online as a starting point, I found that to be the best way to go. I’d love to hear any other advice you’ve found helpful too, until then, let the nightmare continue.